The swelling in the fridge has come down a bit. My three day cooking fest had left us with a lot of odds and ends that I've cleverly used up over the past days. Tonight I had to kill the remainder of the items in the fridge and I knew just how to do it. This idea came to me as if in a dream or a vision. A dream or vision apparently inspired by some large American chain of Tex-Mex themed restaurants with a name like Poblano or Cancun Boon! 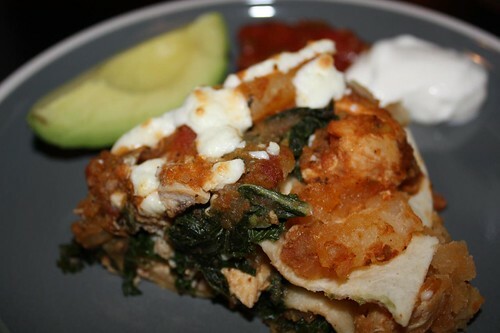 I took the leftover salsa-baked chicken and deboned it layering it with slices of baked potato,steamed kale, and queso fresco between flour tortillas. Then I baked it in the oven until the queso browned up a bit. I cut this bizarre triple-decker open-faced enchi-dilla into wedges like some kind of unholy Tex-Mex pie and served it with a little avocado, salsa, and sour cream. If my tacky American Tex-Mex restaurant ever opens this is going to be a featured item on the "Sombrero Sizzlers" menu. You might want to start off with some Empanada Sliders or a Captain's Ransom Margarita before you order the Triple-Decker Open-Faced Enchidilla. Or, perhaps if you are not adventurous enough to try foods that are pretending to be ethnic, you can just stick to our Gringo Menu. I hear the Gringo Burger is a good option even though it still has that exotic Monterey Jack cheese on it. Oh, man. Cancun Boon is going to be such an amazing restaurant. 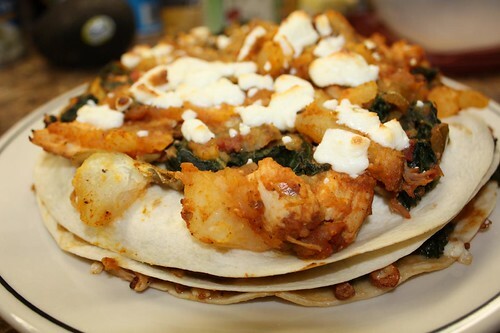 Should have used corn tortillas but looks good. For some reason I just don't like corn tortillas. I think I'm in the minority on that one.